English information (and the English translation of the Proclamation) can be found here. Am kommenden Montag, den 16. April 2012 findet ab 19:00 Uhr der Foursquare Day Ruhrgebiet (#4sqdayRuhr) in Bochum statt. Hierbei handelt es sich um ein Treffen der Nutzer des Geolokalisierungsdienstes Foursquare, der sich wachsender Beliebtheit auch in Deutschland erfreut. Am 16. April 2012 treffen sich weltweit viele Smartphone-Nutzer anlässlich des Foursquare Days – und auch in Deutschland. Eines der größten Treffen Deutschlands findet dabei im Ruhrgebiet, genauer gesagt im Crystal (in der UCI-Kinowelt im Ruhrpark) statt. Die Initiatoren Achim Hepp und Jens Matheuszik hoffen damit, das Ruhrgebiet als aktive Region bei Foursquare zu etablieren – denn normalerweise stehen hier sonst einzelne Städte im Fokus. Die Metropole Ruhr freut sich, dass der Foursquare Day Ruhr am 16. April 2012 erstmals in der Region stattfindet. Foursquare ist eine moderne Art der Kommunikation, die es ermöglicht, sich über die große Bandbreite der wirtschaftlichen und touristischen Angebote dieser und anderer Metropolen auszutauschen. In einer vernetzten Welt müssen sich Regionen in größeren Aktionsräumen organisieren und präsentieren, um im nationalen und internationalen Wettbewerb bestehen zu können. Mit Foursquare öffnet sich der größte Ballungsraum Europas neuer Kommunikationstechniken und erschließt neue Zielgruppen. lch wünsche dem Foursquare Day Ruhr 2012 viel Erfolg und bin gespannt, wie sich dieses zukunftsorientierte soziale Netzwerk entwickelt. Siehe dazu auch die offizielle RVR-Pressemitteilung Erster Foursquare Day Ruhr findet im Bochum statt. Die Anmeldung ist insofern sinnvoll, als dass das die Planung erleichtert. Für die Teilnehmer am Foursquare Day Ruhrgebiet gibt es sogenannte „Swarm Specials“ – das bedeutet, man kann beim Essen und den Getränken an dem Tag einiges sparen. Details dazu gibt es in Kürze über den Twitter-Account @4sqRUHR. Here you can find some information about the #4sqdayRUHR in English. The Ruhr (German Ruhrgebiet, colloquial Ruhrpott, Kohlenpott, Pott or Revier), is an urban area in North Rhine-Westphalia, Germany. With a population density of 7100/km² and a population of some 7.3 million, it is the largest urban agglomeration in Germany. It consists of several large, formerly industrial cities bordered by the rivers Ruhr to the south, Rhine to the west, and Lippe to the north. From west to east, the region includes the cities of Duisburg, Oberhausen, Bottrop, Mülheim an der Ruhr, Essen, Gelsenkirchen, Bochum, Herne, Hagen, Dortmund, and Hamm, as well as parts of the more „rural“ districts Wesel, Recklinghausen, Unna and Ennepe-Ruhr-Kreis. Since the 19th century, these districts have grown together into a large complex with a vast industrial landscape, inhabited by some 7.3 million people (when including Düsseldorf and Wuppertal). It is the fourth largest urban area in Europe after Moscow, London and Paris. The Ruhr Regional Association (RVR; Regionalverband Ruhr in German) is the regional hub of the 11 independent municipalities and four districts of the Ruhr Metropolis and is resposinble for the regional planning for the Ruhr region. It has also legal functions which include the regional business and tourism development, as well as public relations for the Ruhr Metropolis. Head of the RVR is Regional Director (Regionaldirektorin in German) Karola Geiß-Netthöfel. She began her work as Regional Director in August 2011. Before she was government vice president of the Regierungsbezirk of the Arnsberg region. 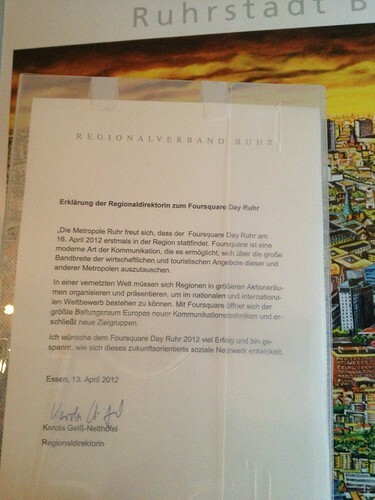 The metropolitan area Ruhr is pleased that Foursquare Day Ruhr is happening for the first time in our area on April 16, 2012. Foursquare is a modern form of communication that allows to learn about the wide range of business and tourism offers in our and other regions. In the new connected world regions must organize and present themselves, in order to survive in the national and international competition. With Foursquare the largest metropolitan area in Europe is embracing new communication technologies and developing new audiences. l wish the Foursquare Day Ruhr 2012 a lot of success and I am curious to see how this future-oriented social network will develop. Bochum/Essen (idr). For the first time digital networkers will meet together in the Ruhr area to take part in the international Foursquare Day. On Monday, April 16 and starting at 7pm smartphone users will meet at the Crystal café within the UCI Kinowelt in Bochum to celebrate the first Foursquare Day Ruhr. Foursquare is a location based social network that works with the GPS feature of a smartphone. If the user logs in, then the current location will be determined. It can then be passed on to friends or communicated via other networks (e.g. Facebook). In addition, the user receives information about his whereabouts and the surrounding area and may also disclose further information to his network. This creates a temporary social network within which participants can communicate as well. If a user is often checked in at the same location, he may even become the “mayor” of this place within Foursquare. The Ruhr area is already recording a high number of participants for their first Foursquare Day. The goal of the initiators is to establish the Ruhr area within the Foursquare network, which usually rather focuses on single cities. Tolle Sache vom Achim und Jens! Es muss nicht immer wieder Mitte oder das belgische Viertel sein! Das Internet verteilt sich nicht nur auf drei Städte in Deutschland.